Durable synthetic rubber loop with recessed rough gripping surface. Magpul Original Equipment (MOE) is a line of firearm accessories designed to provide a high-quality, economical alternative to standard weapon parts. The PMAG 20 AK/AKM MOE is an inexpensive, lightweight, high reliability 20-round polymer magazine designed for Kalashnikov pattern rifles in 7.62x39mm . The PMAG 10 AK/AKM MOE is an inexpensive, lightweight, high reliability 10-round polymer magazine designed for Kalashnikov pattern rifles in 7.62x39mm. The PMAG 10 GEN M3 is a 10-round 5.56x45 NATO (.223 Remington) polymer magazine for AR15/M4 compatible weapons. The PMAG 10 GEN M3 is a 20-round 5.56x45 NATO (.223 Remington) polymer magazine for AR15/M4 compatible weapons. 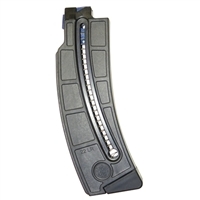 The PMAG 10 GEN M3 is a 10-round polymer magazine for AR15/M4 compatible weapons. 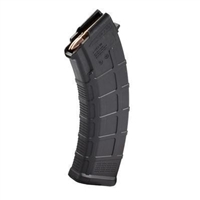 The PMAG 30 AK74 MOE is an inexpensive, lightweight, high reliability 30-round polymer magazine designed for Kalashnikov pattern rifles in 5.45x39mm. The Magpul® PMAG 10 GL9 - Glock G17 and G19 9x19 Parabellum are the highest performing and most reliable restricted capacity magazines on the market. The PMAG® 30 AR 300 B GEN M3™ is a purpose-designed magazine for rifles chambered in 300 Blackout®. Adding capacity and control with a minimal footprint, the PMAG 12 GL9 is a 12-round magazine for the Glock 26. The next-generation PMAG 30 GEN M3 Window is a 30-round 5.56x45 NATO (.223 Remington) polymer magazine for AR15/M4 compatible weapons that features transparent windows to allow rapid visual identification of approximate number of rounds remaining. This is a one-piece molded polymer body with a textured gripping surface that has a 25 round capacity of .22 LR without a load assist button. Made in USA. This is a one-piece molded polymer body with a textured gripping surface that has a 10 round capacity of .22 LR without a load assist button. Made in USA. 21-round Glock 9mm handgun magazine featuring a new proprietary all-polymer construction for flawless reliability and durability over thousands of rounds. The PMAG 30 AUS GEN M3 Window is a 30-round 5.56x45 NATO polymer magazine for Steyr® AUG/F88/F90 compatible weapons that features transparent windows to allow rapid visual identification of approximate number of rounds remaining. The DD Magazine surpasses the standard in strength and durability with its lightweight, cutting-edge carbon-fiber-reinforced polymer construction. Mag Wraps™ come in 3-packs and will fit any 30rd AR-15 Magazine. They are easy to install and offer the ultimate in protection and graphics for your magazines.